Provide comfort for the family of Erna Russell with a meaningful gesture of sympathy. 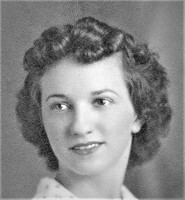 Erna Lois Lea Russell died Monday, March 11. In November 2018 she attained the age of 100 -- a lifespan considerably lengthier than what she expected to reach. 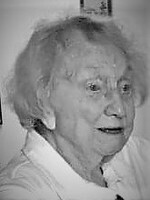 Erna was born to Ella and Walter Lea in Schuyler, Nebraska, on Nov. 4, 1918. Her birth came one week before the armistice was signed ending World War I. At that time a horrendous flu epidemic was raging; because clinics were full, Erna was born at home. Her father had taken dreadfully sick with flu and was in the hospital himself. He did not know he had a baby girl until three days had passed. Erna was adventurous in her early years. As a youngster, she endured countless fractures while attempting a variety of escapades. Then as a young adult she moved to the glamorous realm of Southern California. There, she began a career in restaurant work and soon met her husband-to-be, Homer Chester Russell (Chuck). They married in 1941 and had four children. They divorced in 1954, after which Erna took admirable care of her offspring despite never having much of an income. In 1957 she moved with her kids to Missoula, a change that brought her near her mother’s home in Stevensville. In Montana she began a quarter-century’s employment with the 4Bs restaurant chain. Her last position was managing the 4Bs diner in Deer Lodge. She retired at age 62 having had enough of working long hours on her feet, and then began several years’ transcribing court-reporter records – until computerization ended that career, too. Erna was an avid sports fan especially of baseball and of any contests involving the Montana Grizzlies. So it’s fair to say she pushed her game well into double or triple overtime. Erna is survived by her son John and daughter-in-law Carol of Missoula; son Richard and daughter-in-law Carol of Alaska; and daughter Leanna of Stevensville. A son, Chester William (Bill) died in Canada in December 2008; Bill’s wife Eleanor lives in Regina. Her last surviving sibling, Richard Lea, still lives at the Clark Fork Riverside – where Erna had lived contentedly since 1991 and was the facility’s longest-residing tenant. Erna also is survived by 11 grandchildren, 24 great-grandchildren and 4 great-great grandchildren. Perhaps the most enjoyable part of her 100th birthday celebration was to meet her great-grandchild (Kiana, from Alaska), and a great-great-granddaughter (then six months old). Erna was deeply religious throughout her life. She said not long ago that she was “looking forward to” reaching Heaven. So now, from the best seat in the stadium, she will faithfully monitor every Osprey contest and Montana Grizzly game. A service for Erna will be held Monday, March 18, at the Clark Fork residence, 301 W. Front at 2:00 pm. Anyone who wishes to celebrate the passing of a lifetime of 100-plus years is welcome to join us. To send flowers in memory of Erna L. Russell, please visit our Heartfelt Sympathies Store. We encourage you to share your most beloved memories of Erna here, so that the family and other loved ones can always see it. You can upload cherished photographs, or share your favorite stories, and can even comment on those shared by others.